You love everything about your RV—until a collision or breakdown leaves you stranded on the highway. Your favorite vehicle quickly becomes a burden when you can't find a towing company that hauls anything larger than an SUV. Fortunately, you don't have to linger on the side of the road for long. Just call Chehalis Collision Center for timely, convenient car and RV towing services. 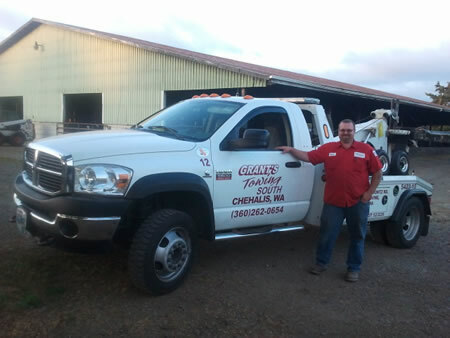 At Chehalis Collision Center, we partner with Grant's Towing to help our clients transport their vehicle safely from the roadside to our garage. 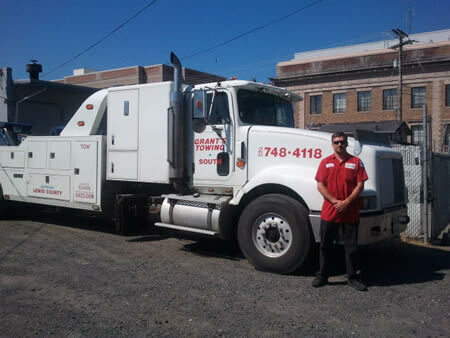 The drivers at Grant's Towing are reliable, quick, and polite. They offer 24/7 emergency services so that you and your vehicle can arrive home safely no matter the time of day or night. Grant's Towing will transport any vehicle from any site, including RVs stranded on highways and cars broken down on driveways or in yards. Don't hesitate to call, regardless of your vehicle's size or condition. Once your RV or car arrives at our shop, we assess the damage and get to work on thorough, detail-oriented repairs. We also do what we can to make the repair process as convenient as possible for you. For instance, if you depend on your car to get around, we offer a shuttle service—we'll transport you safely from our garage to your home between 8 a.m. and 4 p.m. We can arrange a rental car for your use if you have your insurance claim number. We finish your repairs quickly and efficiently to reunite you with your car or RV. At Chehalis Collision Center, we have over 3 years of experience repairing cars and RVs throughout the Chehalis, WA area. Once Grant's Towing moves your car to our shop, you can depend on our team of seasoned technicians to provide trustworthy repairs. To learn more about our towing service or ask about our collision repair, contact us today at 360.996.4263>>.